The Mousetrapper Prime from Mousetrapper is an inline / central pointing device that uses a steering pad mechanism (a hybrid touchpad/treadmill) for cursor control, scrolling and left-click actions. The silicone-coated, slip-free steering pad requires only finger-tip pressure and minimal dexterity to control the movement of the cursor. Cursor control is achieved on the Mousetrapper by using the fingertips to move the steering pad itself. This level of functionality can be contrasted with touchpads, where cursor control is achieved by moving the finger tip across a static surface. The steering pad on the Prime offers two dimensional scrolling and rich secondary features such as vertical scroll. A left click can be activated by simply pressing down anywhere on the steering pad. Eight programmable buttons, plus the steering pad, provide quick access to double click, left click, right click, zoom out, zoom in, cruise (or scroll) down, cruise (or scroll) up, copy, and paste functions. 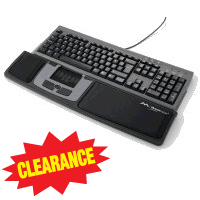 The Mousetrapper Prime features replaceable and wipeable palm supports and has an attached, flexible gray mat on which to place the keyboard. Like most central pointing devices, the Mousetrapper Prime requires no overextension of the shoulder joint, and can significantly reduce the risk of repetitive strain injuries to the muscles of the shoulder and upper back. In addition to the above features, the functionality of the Prime is greatly enhanced by the downloadable MT Keys software, which includes the ability to paste text up to 254 characters long using a single button and to add user profiles. The wireless mode functions via USB with the included receiver, while the rechargeable battery has six months of battery life between charges. Cursor speed can be adjusted up to 2000 dpi. The Mousetrapper Flexible adds flexibility to inline / central pointing devices by offering both wired and wireless operation in a single product. Cursor control is achieved through the use of a steering pad, centrally located directly below the keyboard eliminates the need to move an entire device to change the onscreen position of the cursor. The steering pad is designed to be controlled by by either hand, and provides a slip-free surface for the finger tips, to provide near effortless onscreen navigation and cursor control. The fingers can rest on the steering pad between mouse activation tasks, with clicking accomplished simply by pressing down against the pad. The two-dimensional steering pad offers an intuitive interface that may be easier to adjust to than rollerbars, touchpads or trackballs. It provides effortless access to vertical scroll, browse forward and browse back features. Reprogrammable buttons around the pad provide the standard mouse button functions as well as access to common keyboard shortcuts. Note: Plugging the device in keeps the battery fully charged for mobile use. For portability, the Mousetrapper can be packed into the included neoprene travel bag (SMT507 model only). The included wireless receiver is stored inside the body of the device. Le Mousetrapper Flexible donne la flexibilité aux dispositif de pointage central d'avoir avec fil aussi que sans fil dans un seul produit. Le control du curseur est fait par un pad pilotage (steering pad) qui est centralizer ci-dessous le clavier, qui donne l'acces façile aux deux mains et réduit le bessoin de bouger une souris de côté-a-côté. La surface du pad est effectivement un matiériel adhérence sur les doigts, avec un mouvement d`effort minimale du pad pilotage. Les doigts peuvent reposer légèrement sur le pad pilotage sans risque de faire un clic accidental, et simplement appuier doucement le pad avec les doigts pour accomplir un clic. L'usage du pad pilotage de deux dimensions offre une souris intuitif qui peut être potentiellement plus facile à apprendre que l'usage des rollerbar, des pavé tactiles (touchpads), et des track-ball. Le pad pilotage fournis l'acces facile au défilement vertical, les fonctions de navigation l'avant et de navigation l'arrière. Les boutons autour du pad pilotage peuvent ce faire personnaliser (programmable) pour offrire les fonctions standard d'une souris, aussi que des raccourcis commun du clavier. Veuillez noter: Avoir la souris brancher assure que la pile complètement chargé pour l`usage mobile. Pour les raisons de mobiliter, le Mousetrapper peut être emballé dans le sac inclus fait en néoprène (seulement avec le modèle SMT507). La clé USB est ranger à l`interieur de la souris. 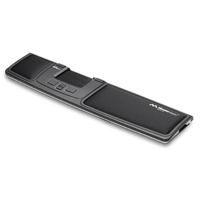 The Mousetrapper Advance 2.0 is an inline / central pointing device that uses a steering pad mechanism (a hybrid touchpad/treadmill) for cursor control and left-click actions. The silicone-coated, slip-free steering pad requires only finger-tip pressure and minimal dexterity to control the movement of the cursor. Cursor control is achieved on the Mousetrapper by using the fingertips to move the steering pad itself. This level of functionality can be contrasted with touchpads, where cursor control is achieved by moving the finger tip across a static surface. The steering pad on the Advance 2.0 offers two dimensional scrolling and rich secondary features such as vertical scroll. A left click can be activated anywhere on the steering pad. Buttons around the steering pad provide quick access to double click, left click, right click and middle click functions. 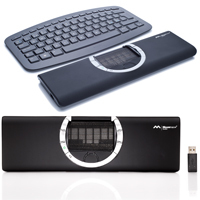 The Mousetrapper Advance 2.0 features replaceable lycra-covered palm supports and has an attached, flexible gray mat on which to place the keyboard. Like most central pointing devices, the Mousetrapper Advance 2.0 requires no overextension of the shoulder joint, and can significantly reduce the risk of repetitive strain injuries to the muscles of the shoulder and upper back. The Advance 2.0 differs from the Advance (SMT417) cosmetically by being available in two models with stylish accent colours: white (MT112) or turquoise (MT113). Functional differences include six programmable buttons instead of five — the central button on the Advance has been replaced in the 2.0 with two scroll buttons for up and down. In addition, the palm supports on the Advance 2.0 are replaceable (unlike those on the Advance), which makes cleaning the palm supports much easier. The Mousetrapper's steering pad offers two dimensional scrolling and rich secondary features such as vertical scroll and Back/Forward functions when using a web browser. A left click can be activated anywhere on the steering pad. Buttons around the steering pad provide quick access to double click, left click, right click and middle click functions. 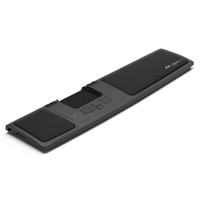 The Mousetrapper Advance features palm supports and has an an attached, flexible gray mat on which to place the keyboard. Like most central pointing devices, the Mousetrapper Advance requires no overextension of the shoulder joint, and can significantly reduce the risk of repetitive strain injuries to the muscles of the shoulder and upper back. Note: Model SMT407 is DISCONTINUED and on CLEARANCE. Compare Central Pointing Devices: Mousetrapper Advance Plus, Mousetrapper Flexible, RollerMouse Re:d, Rollermouse Pro2, Rollermouse Free2. Le Mousetrapper Advance est un dispositif de pointage central unique qui utilise un pavé tactile (touchpad) hybride, un tapis roulant appeler un pad pilotage. Le pad pilotage est fabriqué avec une surface enduit de silicone, onduté, qui offre le control façile du doigt, exige l'effort minimale aussi que le dextérité physique pour accomplir les besoins du souris. La surface du pad est effectivement un matiériel adhérence sur les doigts, qui façilite le mouvement du pad pilotage. Le control exige l'effort minimale car le pad bouge sans effort, comparé a une surface qui ne bouge pas comme un pavé tactile (un touchpad) ou ce que le doigt glisse par dessus. La technologie unique offris par le défilement deux dimensions offre une interface plus intuitif que les rollerbar, les pavé tactiles, ou les track-ball tandis de maintenire la deuxième caractéristique avantageuse du défilement vertical intégrée, aussi que les fonctions de navigation l'avant et de navigation l'arrière durant la navigation du web (comme sur un pavé tactile fait par Cirque). Le clic gauche peut ce faire n'importe quand, et n'importe ou sur le pad de pilotage. Il a aussi des supports-main pour donner un coussin pour vos paumes pendant la dactylographie, et pendant l'usage du pad pilotage. Il vient boitier en noir avec un tapis gris et flexible pour mêtre votre clavier dessus. Comme la plus part des dispositif de pointage centrals, le Mousetrapper Advance fonctionne comme une extension du clavier qui empêche de trop s'étirer. Il y a d'autre boutons discrètes autour du pad pillotage qui fait le double clic, le clic gauche, le clic droite, et le clic millieu. Veuillez Noter: Le clavier n'est pas inclus. Le modèl SMT407 est DISCONTINUER et est dans notre catégorie de CLEARANCE. Comparez la Mousetrapper Advance Plus avec la RollerMouse Re:d et la Pro2, la Free2, et le Mousetrapper Flexible. The Mousetrapper Armrest is designed for supporting the forearms while keeping hands as close as possible to any Mousetrapper central pointing device, such as the Advance 2.0 or Prime. By resting the forearms on the Mousetrapper Armrest, the smaller muscles of the upper back and shoulders no longer have to carry the weight, reducing fatigue, and pain in these muscle groups. The support can also work well for those who use a traditional, straight-edged keyboard. 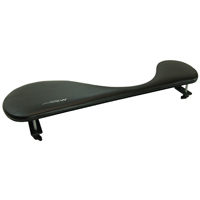 The Mousetrapper Armrest combines minimalist styling with solid craftsmanship for easy tool-free assembly and installation. The surface is composed of a polyurethane foam pad covered with black artificial leather. The foam cushioning helps to prevent injury to pressure-sensitive areas on the inside of the arm, and the artificial leather cover offers frictionless movement. The cover can also be cleaned and disinfected as necessary. The included steel brackets and winged bolts clamp the Mousetrapper Armrest securely to the desk or table. Note: The black, artificial leather covering has the Mousetrapper logo printed on it. Note: Arm and hand support solutions which elevate the hand above the mousing surface can subtly change hand placement on some specialized mousing devices, potentially affecting the manner in which the user interacts with the devices and possibly limiting the ergonomic benefits generally associated with them. With some products these changes may be more significant than with others. Please call to speak with a Customer Service Specialist to discuss the compatibility of this product with the intended pointing device. 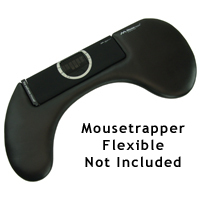 The Mousetrapper Armrest for Flexible is designed specifically for supporting the forearms while keeping hands as close as possible to the Mousetrapper Flexible central pointing device. By resting the forearms on the Mousetrapper Armrest for Flexible, the smaller muscles of the upper back and shoulders no longer have to carry the weight, reducing fatigue, inflammation, and pain in these muscle groups. The Mousetrapper Armrest for Flexible combines minimalist styling with solid craftsmanship for easy tool-free assembly and installation. The surface is composed of a polyurethane foam pad covered with black artificial leather. The foam cushioning helps to prevent injury to pressure-sensitive areas on the inside of the arm, and the artificial leather cover offers frictionless movement. The cover can also be cleaned and disinfected as necessary. The included steel brackets and winged bolts clamp the Mousetrapper Armrest for Flexible securely to the desk or table.